was having a serious need for chocolate and so I didn't wait the proper amount of time for the peanut butter filling to set up before I put the chocolate glaze on and so I may have melted some of the peanut butter filling...oops. It was still delicious though. But I really recommend waiting for the peanut butter filling to set up then it will look much thicker like in her picture. The original recipe also has you dipping the brownies with pb filling on top in the chocolate glaze, yeah, you could do that too. :). 1. Preheat oven to 350F. Grease square 8"x8". (For thinner brownies use a 9"x13"). 2. Combine melted butter with sugars, and vanilla in a large bowl. 3. Beat in the eggs, one at a time, mixing well after each, until thoroughly blended. 4. Sift together the flour, cocoa powder, and salt. Gradually stir the flour mixture into the butter mixture until well blended. Stir in the chocolate chips. 5. Pour into prepared pan and bake 35-40 minutes or until a toothpick inserted a little off center comes out clean. (I tend to under bake mine because I like them fudgier). Cool completely. 6. In the bowl of a mixer, beat 1 stick of butter, peanut butter, and vanilla until combined and smooth. Add powdered sugar and beat on medium high until combined. 7. Add milk and beat on high for about a minute. Spread on pan of brownies and refrigerate for a couple of hours, until frosting is cold and firm. 8. Place 1 stick of butter and chocolate chips in a large microwave safe bowl. Melt in the microwave, stopping to stir at 20 second intervals. 9. 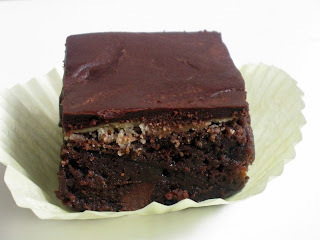 Once melted and smooth, cut brownies into squares and dip the top half of each in the chocolate. Place on a baking sheet and spoon powdered sugar over the top.